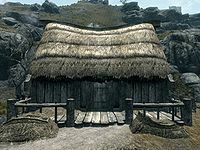 Lund's Hut is a small house located just northwest of Rorikstead (west of Whiterun). To reach the hut take the road northwest out of Rorikstead and follow it until you come to a dirt path on the left, follow that to the hut. The house is a single level, fairly rundown building with a fenced off porch area at the front. There are four skeevers using a couple of moldy straw bales for bedding outside the house. Northwest of the house a few paces is a cairn with a lit candle and a silver ring (which may have fallen to the ground) on the edge and a basket containing three red apples and a loaf of bread on the ground. To the left of the house is a tree with two blue mountain flowers by the trunk. There are several thistles and more blue mountain flowers lining the path leading from the road to the house. The house is unlocked and contains two more skeevers. The corpse of the original owner, Lund, is in a single bed in the eastern corner of this one room hut. The place is a mess: clothes, furniture and food are scattered around the room. There is an unlocked chest containing minor loot at the foot of his bed, an eidar cheese wedge in a cast iron pot under the bed and a blue dartwing right in the corner between the bed and the wall, under a basket. Beside the bed, against the southeast wall is an end table with a bottle of alto wine on top. Along the rest of the southeast wall is a sack and barrel of foodstuffs with a barrel of ingredients behind the first. In front of these is a low table with a mead barrel and two bottles of Honningbrew mead on top. To the right of the barrels, against the southwest wall is a long wooden table, under which are two pheasant breasts. On the table is a bottle of poison, a bottle of alto wine and several red apples. To the right of the table is a wooden bench and a couple of chairs laying on their backs and various items of footwear and clothes underneath. 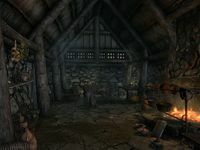 To the right is a fireplace that is still lit, with a cooking pot and spit in front and a mounted skeever head above. On the mantelpiece is a blue butterfly wing. and in front of the hearth are three wooden bowls, two contain pheasant breasts and the other contains a chicken breast. In the western corner is another long wooden table and bench with a patch of imp stool fungus growing beside it and in the corner behind it are two more blue dartwings. In the northern corner is an open crate containing a butterfly wing, a sample of giant lichen, a joint of raw beef and various items of clothing, with a second butterfly wing between the crate and the wall. Along the northeast wall is a set of shelves with three common books, with more on the floor in front. Between the shelves and the entrance is another wooden bench, with a bottle of wine and a portion of grilled leeks on top and a wall shelf above holding a bulb of garlic. Hanging from the ceiling above is a garlic braid and a bunch of dried frost mirriam. The door to Lund's Hut is owned by Ulfberth War-Bear. This page was last modified on 7 January 2019, at 04:31.